Flights to Bali Are Half Price Right Now From All Over the U.S. The longest winter ever has decided to stick around for another week, so it's understandable if you're feeling the need to get away. 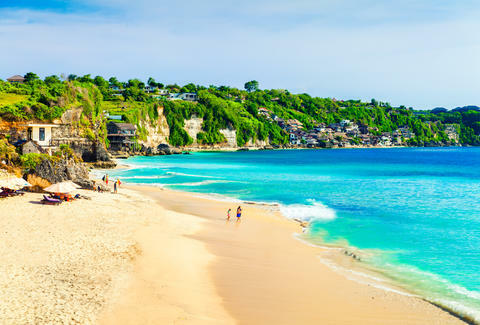 Luckily, some unbelievably low roundtrip fares to Bali have popped up unexpectedly and you can get far, far away from this clingy winter on the cheap. Flights to the stunning Indonesian island are available from a handful of major American cities with rates between $500 and $600 -- that's under half of what you'd normally expect to pay roundtrip. These rates were pointed out by Scott's Cheap Flights, and are only expected to last a day or two, so you better get on it. Most of the trips are showing up between October and November of this year and January through March of 2019, so you'll have plenty of time to figure out logistics before you depart even if you book right away. Roundtrip fares were found from Chicago to Bali for $564, from Los Angeles for $564, from San Francisco for $564, from Seattle for $587, and from New York City for $596. All of these are approximate and will vary depending on when you book, but considering a normal trip is around $1,200, you're getting a bargain even if the prices rise in the next day. You'll be flying with EVA Air, a Taiwanese international airline that also happens to be a five-star airline. So, try out a few dates ranges on Google Flights to find the best deal and time range for you. Again, these rates could change at any time, so if you come across something under $600 it might be worth just booking a trip to paradise and figuring out the details from there.